When you think of Madrid, wine is probably not the first thing that springs to mind. La Rioja is probably the most famous wine regions of Spain but it is not too convenient if you do not have much time. Just over a year ago a friend who is a chef introduced me to a local wine that is nothing less that grand. Big and beautiful and surprisingly from Madrid! 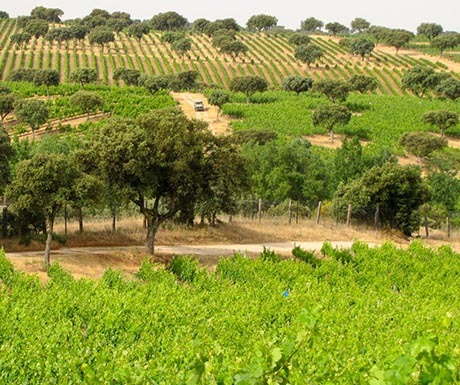 Just a 35 minute drive from the center of Madrid you will find one Spain's best kept wine secrets, Valquejigoso Vineyards. This relatively small family run estate of 59 hectares, is planted with Cabernet Sauvignon, Cabernet Franc, Merlot, Petit Verdot, Syrah, Tempranillo, Garnacha, Graciano y Negral producing two red grand wines, V1 and V2, in some of the most modern facilities in Europe. The landscape from afar looks flat but closer inspection reveals its rolling green valleys covered with grapes and olive trees and at its center we find the family villa. When I arrive at the villa for my first visit I wondered where was the bodega?" Where do they produce the wine? The director of Valquejigoso explained to me that all of the production takes place underground, under the villa, maintaining the environmental aesthetic of the natural countryside. 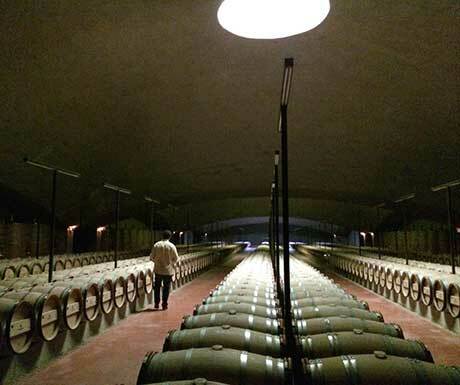 The underground facility is huge considering the limited production of this exclusive wine. V2 is priced at about 62 euros a bottle with production at 17,000 bottles and V1 at about 420 Euro per bottle at 1500 bottles, and then only released if the owner feels that the wine is good enough! On my visit we toured the vineyard in 4×4 and afterward were invited for a vertical tasting. During our visit the enologist and director, Aurelio, pointed out how the land produced grapes of different quality and how grapes from the top of a particular hill would produce wine that was different from the same grapes at the bottom of the hill. We then tried the wine from barrels at different stages of its production, when it was in the barrel a year, three years and off course taste from the bottle. We even got to try the wine from the very spot we saw during our tour, from the top of the hill and how it differed from the wine in another barrel that came from grapes at the base of the hill. It was a great example of how truly complex wine making can be. The estate is not running mass tours and tastings or accepting bus load of tourists but you can visit by appointment. A tour of the vineyard and wine production facilities with a vertical tasting is approximately 80 euros per person. And if you really want to get the most out of your visit, a barbecue lunch of grilled venison or beef tenderloin with all the best Spanish delicacies can be arranged for a small group.